All of McLaren’s films may be considered as filmic adventures in-between, both in the sense of intervening between frames in unexpected ways, and in treating the film strip, that physical thing that ordinarily mediates between camera and projector, as the primary object of artistic activity. “Animation”, McLaren commented, “is manipulating the difference” (2). McLaren’s first entirely animated film, Love on the Wing (1939), is an exercise in constant metamorphosis inspired by the example of Emile Cohl, creator of “the first cartoon” (Fantasmagorie, 1908). In McLaren’s film an envelope unfolds and delivers itself up to the powers of animation, transforming, multiplying and dividing its own contents and possible messages. The evolving flow of forms bifurcates intermittently into two simultaneous streams, putting shapes into dialogue/struggle with each other. A bone with angel’s wings becomes a winged pair of scissors, the wings detach themselves and fly off from the scissors, a column re-enters from screen left to be cut in two by the scissors… and so on. Across all these metamorphoses a sense of rhythmic memory through transformation is maintained; the column “remembers” the bone, etc. The film was rejected as “too Freudian” for distribution by the Office of the British Postmaster General. 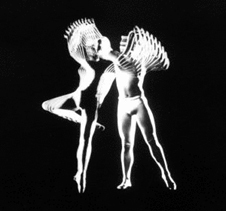 McLaren commented: “For me, cinema is a form of dance.” In Dollar Dance (1943), a suspiciously happy whistling tune and Disney-like voiceover provide the soundtrack for another experiment in metamorphosis, this time focussing on the protean capacities of that “universal fetishised equivalent” (Marx), the dollar. A dollar sign tells us “you can turn me into anything you like: a loaf of bread or a brand new bike”… and so on, as it transforms itself through a veritable legion of figures, occasionally reasserting its basic shape, twisting its serpentine curves and pitchfork-like bars to intimate the form of a devil. McLaren’s own low-budget career demonstrates the possibility of achieving prodigious creativity through very limited means, but also the necessity of basic finances. If not for the constant support of the National Film Board of Canada, from 1941 till 1984, initially at the invitation of famed documentarian John Grierson, McLaren’s own experimental career may not have achieved or sustained the ever varying shape that it did. In Hen Hop (1942), a bird dances to a barn stomp, occasionally liberating parts of itself from the encumbrance of the whole, finally reducing itself to the abstract movement of lines. As with many of McLaren’s films, this camera-less piece was produced by directly inking and scraping the film strip. In researching the daily life of actual hens, McLaren apparently experienced a form of “becoming-animal” (Deleuze) often testified to in strikingly similar terms by commercial character animators: “When doing Hen Hop for instance, I felt that I was… that… doing the dance…. I sort of got imbued with the spirit of henliness, I think. So, in a way when you’re animating a creature, if the creature is moving, you are that animal, you feel the motion.” Picasso, who can be witnessed apparently attempting to become an animator in “real-time” as he performs for Henri-Georges Clouzot’s camera in Le Mystère Picasso (1956), is said to have declared “at last something new” upon viewing this film. The important Dutch art animator, Gerrit van Dijk, reproduces sections of the film with his own hand, as well some of the lines quoted above, in his I Move, So I Am (1997). Là-haut sur ces montagnes (1946) pioneers McLaren’s “chain of mixes” technique: a single chalk drawing is subject to thousands of subtle modulations through the addition, subtraction, or blurring of basic black or white traces. Each change is blended by a camera into an evolving whole, evoking the ceaseless atmospheric play of light and shade across the face of a mountain. Here, as elsewhere, McLaren encrypts the transfiguring form of a woman into his art, finding her body in the contours of the mountain, tracing her face from a constellation of stars. A sense of simultaneous intimacy and distance, immediacy and memory, evanescence and permanency is sustained through the most austere means. La Poulette Grise (1947), another piece realised through the “chain of mixes” technique, reactivates the chicken obsession that runs (or skitters) through McLaren’s work. A chicken fades in and out of existence, sometimes situated within a homely barn, sometimes seemingly sent floating through starry space. The image undergoes reversals of defining relationships between figure and ground, the intermittent reformation of a bird figure providing a connecting thread. Sometimes the bird appears to be made from jewels, sometimes these jewels become facets of the night sky. Glowing eggs emerge around the seated form of the bird; a single egg appears inside its body; the form of the egg is externalised and displaced as a moon on which the bird is perched, or becomes stars which encircle the bird. The enigmas of the inside and the outside seem to modulate each other to infinity. Which comes first; the chicken or the egg? Given no answer, we see only incessant transformation. McLaren was gifted with a synaesthetic imagination: music produced a flow of images and colours in his mind’s eye. Like many of McLaren’s films, this piece is set against a French folk song and constitutes an experiment in the relation between music and moving images. The piece was inspired by Alexieff and Parker’s seminal experiments in pinscreen animation. 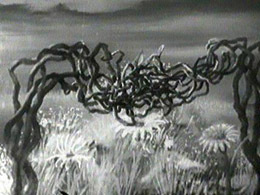 Neighbours (1952) is a stop-animated piece in which two men go to war for the right to possess a flower that springs from the soil. This Oscar winning anti-war parable without words has been described as both the very best and the very worst of McLaren’s films. McLaren himself, who worried much about the “narcissism” of his more abstract art (and thematised this concern in several works), claimed to value Neighbours above all his other films. His friend, John Grierson, decried it as hopelessly “naïve”, proof that McLaren should be content with the stuff of fancy. It is possible, however, that the very naivety of this film is the source of its strength and pathos. Sensitivity to the beauty of a flower – that is, transcendence of self – leads to war – that is, to the murderous assertion of self. The flower is soon crushed underfoot; picket fences are converted into deadly weapons; house, family, and the two men themselves are inevitably destroyed, but each ends up with the coveted prize pinned to his chest, as deathbeds becomes flowerbeds. If you looked at a single frame of film you’d say that doesn’t mean anything there, there’s no images there, but once the thing goes into motion, the things that are there, no matter what kind of shape they may be, can behave in a human or animal way, which echoes something quite human in a person. Once things begin to move the difference between figuration and abstraction concerns not only distinctions between shapes, but also distinctions between kinds of movement. Much of McLaren’s work examines the limit between figuration and abstraction by testing the threshold between two modes of movement: the organically motivated and the inhumanly geometric. In Lines: Vertical (1960) and Lines: Horizontal (1962) straight lines multiply and move in linear trajectories, varying their speed of movement and relative distances. Responding to the themes of modernist abstraction, these films exploit the rhythmic possibilities of geometric motion, exploring flatness and its self-denial in the context of animation. Mosaic (1965) constitutes another exercise in “inhuman” geometric movement – except for its first few frames. In the opening sequence, McLaren appears on-screen to release an elementary particle of animated energy into a void contained by the edges of the screen, rehearsing a classic gesture from the history of animation (e.g., the Fleischer brothers’ Out of the Inkwell series) in which the animator is shown giving life to forms from the flatness of ink. Partly inspired by the logic of Indian classical music, this piece generates a universe from the self-differentiation of a single “cell” or “germ”. The one gives birth to the many as the screen is consumed by flickering patterns and alterations of colour. This work might be compared to the moving mandalas synthesised by art animator, John Whitney (creator of the Vertigo title sequence with Saul Bass). 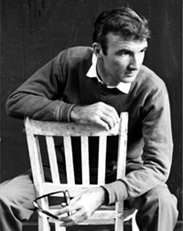 The documentary, Norman McLaren: Creative Process (Donald Williams, 1990) traces the constantly varying, yet coherent trajectory of the artist’s career as an experimenter with the possibilities of film, culminating in a final scene where an aging McLaren has his own dancing form reanimated and duplicated as a shifting white shroud that eventually melts into the general whiteness of the image. Across all of McLaren’s work, the process through which the image has been created changes and shapes the temporal structure of the image itself. Animated art analyses and expresses the unfolding of its own creative process: it becomes a kind of “meta-art” whose primary object is the creative process itself as the paradoxical discovery of something which emerges and exists only in this very process of discovery. Paraphrased in Chuck Jones: Life of Animated Cartoonist, Farrar, Straus and Giroux, New York, 1990, p. 180. All further quotes from McLaren are taken from the documentary Norman McLaren: Creative Process (Donald Williams, 1990).